Rosses Services Workshop, Cleveragh Industrial Estate, Sligo. This facility is located at Cleveragh Industrial Estate, Sligo. These activities are carried out in our new refurbished premises, which has developed as a result of Person Centred Planning process. We have much smaller structures which are user friendly for the various ranges of Activities currently provided at Cleveragh. 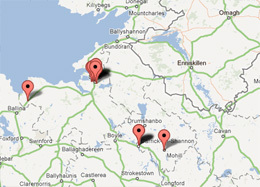 In addition, to the above our Service Users avail of educational and training programme’s delivered by Sligo I.T, V.E.C. and Local Community Training Centres. Funding has been secured from Sligo Leader, V.E.C. and the Arts Council. We would like to acknowledge the Health Service Executive, and in particular the Training and Occupational Support Services, West for their ongoing funding and support. Each Service User has a Person Centred Plan in place identifying goals which is constantly reviewed, evaluated and updated by Staff Team in conjunction with Multi-Disciplinary Team. H.S.E. West. As an integral part of the Services delivered at R.S.W Service Users still engage (by their own choice) to partake in packaging and labeling products for sale in the market place as part of their occupational activities. We greatly depend on revenue generated from the business to meet the overall running costs of this unit The business element is very important because we have long standing relationships built up with customers over the years who support us generously because of the historic nature of the business as set up by the North West Parents and Friends Association to give employment to adults with an Intellectual Disability in the early seventies.